I’m sure you’ve run into lameness challenges in the past – or perhaps you’re currently facing some challenges? Or maybe they’re looming around the corner, but you’re not aware of them yet. Let’s take a closer look at the different approaches and checks we need to have in place for optimal lameness control. We can split our approaches to lameness control into two categories: Preventative care and Curative care. In this overview, I take a look at these two approaches and make some comments about both. Let’s start with the one that seems to be the easiest and gives us the best return. Preventative hoof care is defined as “Methods to avoid the occurrence of disease (lameness).” What this means is that there are no problems present. This scenario occurs in a perfect world, but it’s not what you usually find in your dairy herd. Even in this perfect world, there can still be factors that could, over time, develop into a lameness challenge. Let’s compare this to milking and mastitis prevention: you provide dry bedding and pre- and post-dipping to the animals to prevent mastitis from occurring. Still, the factors that lead to mastitis are often present: possible genetic predisposition, bacteria in the barn and on the udder, etc. With these factors present, you use all the means available to minimize the chances of problems developing. In today’s dairy industry we’ve come to a practical definition of the word “prevention”. This definition is as follows: “Methods to treat an existent problem in its early stages before it causes significant morbidity.” Morbidity refers to the lameness ‘state’ of the cow or the incidence of lameness in the herd setting. This practical definition tends to become a standard, although on a slippery slope. If we want to get the best results and return on our investment, it’s important that we have a proper definition. Let’s draw the comparison again between mastitis treatment and lameness: “once a cow gets mastitis, she receives treatment to cure the problem and get the milk back in the tank ASAP.” Lameness is really no different, is it? Cow comfort: stalls, bedding packs, ventilation, etc. A simple hoof trim to balance the claws and apply some trimming techniques to shift weight from the sore claw to the healthy claw. Placing a wrap for an infectious problem using the Intra Hoof-fit Gel. Figure 1. Intra Bath in Use. I often hear the statement that footbaths are especially needed to prevent lameness, and they’re definitely a great tool to be used. But still, I would suggest that the footbath method is only to be used as a part of the preventative care category. And I would also encourage looking at the prevention category across a wider spectrum. 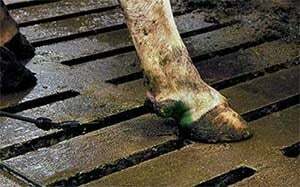 A footbath on its own is never going to correct a poor stall or an improper trim, etc. A great weapon in the hoof care prevention arsenal is the parlor spraying method. The milkers set a regular time for spraying the hind hooves of all cows during milking or in the stanchion lockups. This once-weekly ‘focus session’ maintains preventative care, concentrating at the same time on identifying potential problem animals. Over the past years, researchers at the University of Calgary developed a practical way to routinely identify and treat painful DD lesions in the milking parlour. The next challenge was to determine whether treating lesions in the parlour could be practical and effective. Their research produced very encouraging results and showed the spraying method is successful in optimizing hoof health. Figure 2. Spraying Intra Hoof-Sol Liquid on a cow hoof. 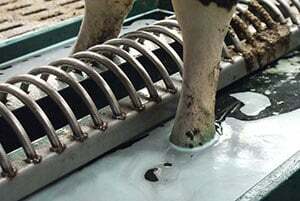 A clean and consistent solution for all hooves in contrast with the footbath method, where the last cow gets the dirtiest solution (she is usually your lame cow). A weekly focus allows finding and detecting new lameness cases promptly; a footbath protocol often lacks this focused approach. Lower volume of product usage delivers a better ROI. Some herds use a 5-liter Matabi applicator or utilize the teat-dip system for hoof care spraying. We recently met producers who are testing a new Do-It-Yourself tool to bridge the gap between preventative and curative care. They put the tool together by using a regular diaphragm pump and air compressor. During the spraying sessions, they compile a list of animals to work on in the hoof trimming chute. Why should we spray only the rear hooves? Concentrating on them will often suffice because hoof problems are more common in the hind legs. Monday and Tuesday: foot-bathing method using Hoof-Sol BATH. Wednesday: spraying session with Hoof-Sol LIQUID or Hoof-Sol SPRAY; make a list of cows to work on. Thursday and Friday: treatment and trimming days (trimming, blocking, gel wrapping, rechecks, etc.) using Hoof-fit Gel. Monday morning: removal of all wraps. As a final note, thank you to the dairy friend who suggested this topic of lameness control strategies. I would like to say that it’s rather difficult to find the right words and overall coverage for this topic. I apologize if I missed anything – perhaps your operation has different challenges. If you want to forward any ideas or suggestions, please send me a message through the Contact page. This article was also published in the Progressive Dairyman (June 2017). You can download the published article (in PDF format), and feel free to share it with others! Found this article interesting? Please help us by sharing this information by using the share links on the side.